Professor David Payne, an internationally distinguished research leader in photonics and Director of the Optoelectronics Research Centre (ORC) at the University of Southampton, has been named the 2008 Marconi Fellow and prize-winner for his pioneering work in the field of fibre optoelectronics and fibre telecommunications which has enabled technology for high speed data transmission. The Marconi Society, established in 1975, annually recognises a living scientist who, like Guglielmo Marconi, the inventor of radio, shares the determination that advances in communications and information technology be directed to the social, economic and cultural improvement of all humanity. Recent winners have included Google founders Sergey Brin and Larry Page. The award and $100,000 prize will be presented to Professor Payne at the annual Marconi Society Award Dinner on 26 September 2008 at the Royal Society in London. A professor of photonics and member of the University of Southampton's faculty for 40 years, Professor Payne's contributions in optoelectronics have had a major impact on areas ranging from telecommunications and optical sensors to nanophotonics and optical materials. Many of the special fibres used today resulted from his work. His invention of the erbium-doped fibre amplifier (EDFA) propelled remarkable Internet growth by enabling the transmission of vast amounts of data through the use of multiple optical wavelengths. Today a single EDFA can amplify up to ten terabits per second of digital information, enough for nearly a million high-definition television channels. Professor Payne's recognition by the Marconi Society extends beyond academia to his achievements as an entrepreneur, which are an important component of the Marconi Prize-winner selection criteria. Expressing his delight at receiving the Fellowship from the Marconi Society, Professor Payne said: "It is a huge honour to be recognised along with the entire photonics community for my contribution to the field of optical telecommunications. Optical telecommunications is man's largest machine and is one of the greatest achievements of the last 100 years. I am immensely proud that my work is seen by the Marconi Foundation as having played a part in this remarkable technology and its massive impact on society." Commenting on the award, University of Southampton Vice-Chancellor Professor Bill Wakeham said: "David has made a unique and vital contribution to the field of fibre optoelectronics and fibre telecommunications, without which today's advances in high-speed global communications would not have been possible. I am delighted that his academic and entrepreneurial vision is being recognised by the award of the prestigious Marconi Prize." Robert Lucky, Marconi Society chairman, said: "We look for scientists who, like Marconi himself, have had the vision not only to make breakthrough discoveries, but to apply these successfully for the benefit of mankind. David's activities have led to the development of numerous companies, creating jobs and wealth in the local community and facilitating worldwide commerce and knowledge sharing. He perfectly fits the profile of a Marconi Fellow." In all, there are ten photonics companies in the Southampton area who owe their existence to the ORC. 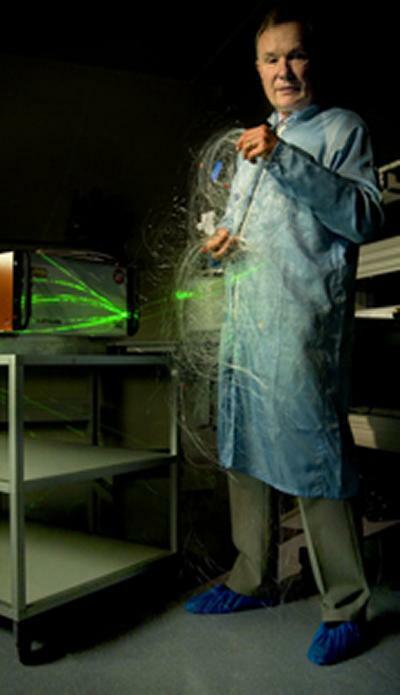 Among the most notable companies Professor Payne has jointly founded are York Technologies (now part of PK Technology Inc.) and SPI Lasers plc, a leading supplier of high-power fibre lasers located at Hedge End, Southampton, which is currently listed on the Alternative Investment Market (AIM) at the London Stock Exchange. The Optoelectronics Research Centre (www.orc.soton.ac.uk) at the University of Southampton is one of the largest university-based research groups entirely devoted to optoelectronics in the world, and has maintained a position at the forefront of photonics research for over four decades. Its long and well established track record in the fields of optical fibre, lasers, waveguides, devices and optoelectronic materials has fostered innovation, enterprise, cross-boundary and multi-disciplinary activities. It has built strong links with industry, research institutions and universities around the world, from informal collaborations to large-scale funding. Several spin out companies, including Southampton Photonics Inc, Stratophase Ltd, Mesophotonics Ltd and ChG Southampton Ltd, have commericalized the fruits of ORC research; while its extensive outreach programme has brought lasers and optical fibres into schools across the country. The Marconi Society was established in 1974 through an endowment set up by Gioia Marconi Braga, daughter of Guglielmo Marconi, the Nobel laureate who invented radio (wireless telegraphy). The Marconi Society at Columbia University is best known for the Marconi Prize, awarded annually to an outstanding individual whose scope of work and influence emulate the principle of "creativity in service to humanity" that inspired Marconi. Through symposia, conferences, forums and publications, the Marconi Society promotes awareness of major innovations in communication theory, technology and applications with particular attention to understanding how they change and benefit society.